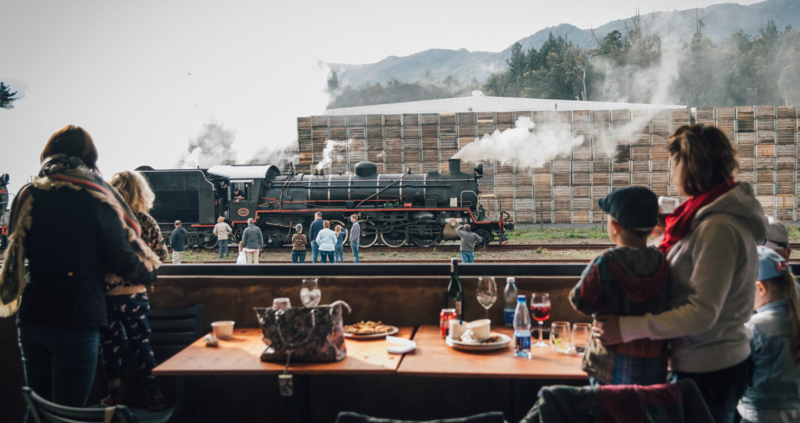 The Elgin Valley is one of the Western Cape’s best kept secrets and TravelGround recently had the privilege to explore the Elgin Railway Market and some of this gorgeous valley’s gems. This Overberg phenomenon is about an hour’s drive from Cape Town and the abundance of orchards, forests, vineyards and mountain views create the perfect countryside setting where you can switch off and indulge in the finer things in life. 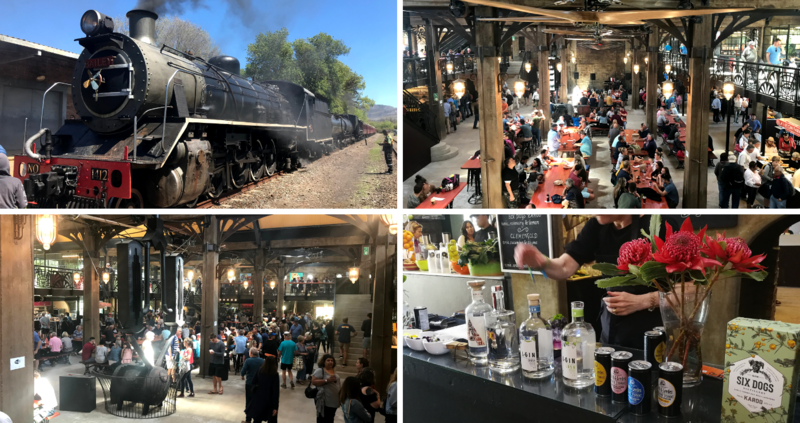 We spent the weekend perusing the new Elgin Railway Market, sipping cool-climate wines, feasting on delicious meals and even enjoying some bow-and-arrow activity. But wait, let us show you what we got up to during our glorious two-day Elgin stay! The Elgin Railway Market is definitely the talk of the town and we can understand why. Hundreds of visitors flock to this market every Saturday between 09:00 and 19:00 and Sunday between 09:00 and 17:00 to greet the steam train as it rolls into the station, enjoy local products, listen to live music and socialise with friends and family. The market is also open on a Friday from 16:00 to 20:00. Visitors can arrive in a unique fashion aboard the steam train on Saturdays and Sundays in partnership with Ceres Rail Company or commute there themselves — there is more than enough parking space. Roger Orpen converted the old apple warehouse into the unique steampunk market to create a hub where visitors can buy local products and have a peek into the lovely valley. The vendors are carefully selected to offer visitors the best options and you are definitely spoiled with a wide range of delicious meals, tasty treats, craft gin and beer, great coffee and fresh produce. If you’re feeling adventurous you can take a segway tour from the market to the neighbouring Oak Valley Wine Estate and marvel at the beautiful surroundings. And don’t worry about the kids getting bored — there is a fun climbing wall and play area to keep them entertained! We started our morning with a proper flat white from Ground Central Coffee before we left the building to wave hello to the steam train. After all the excitement and photos we were ready for something to eat — we enjoyed curry-mince vetkoek from Ella’s Elgin Farm Foods and paired it with refreshing craft gin from L-Gin. In between walking around and enjoying the lively vibe we snacked on delicious handmade fudge. Our next stop was SóVinhos on the upper level where we sipped on some delicious wines from the valley. Carla Lopes started this unique wine shop to showcase the Elgin Valley’s fantastic wine selection and after our tasting we can attest to the fact that they offer delicious wines. You can even stock up on some of your favourites here and keep in mind that the wine shop is open during the week as well. After our chat with Carla we swung by Pudding & Pie for some sweet treats and bid farewell to one of the best markets that we have ever visited. Wine lover or not, the lovely Almenkerk Wine Estate promises to be one of your highlights during your visit to Elgin. 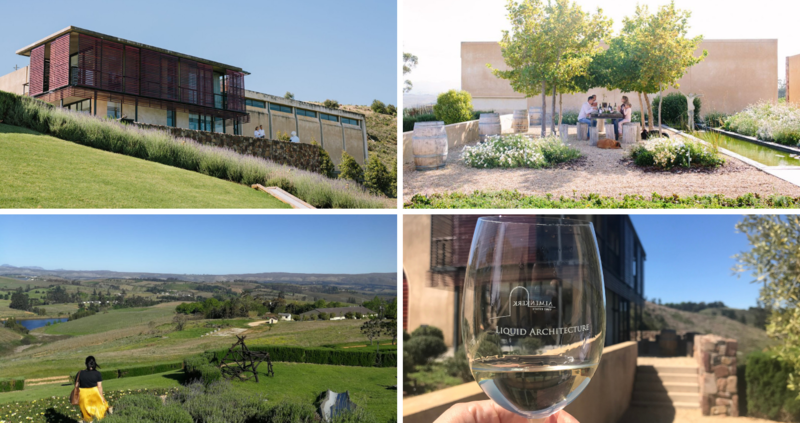 This beautiful wine farm started out as an apple farm in 2002 and since then Natalie and Joris transformed it into an estate that produces award-winning wines. They also have a spectacular view of the valley. Take it all in while enjoying some cool-climate wines beneath the trees or in the elegant and homely tasting room. We particularly enjoyed the Lace Sauvignon Blanc and Lace Dry Rosé on a warm summer’s day in the valley while trying our hand at a couple of rounds of boule. The fun-filled day ended on a high note at Trail’s End where we spent the night. 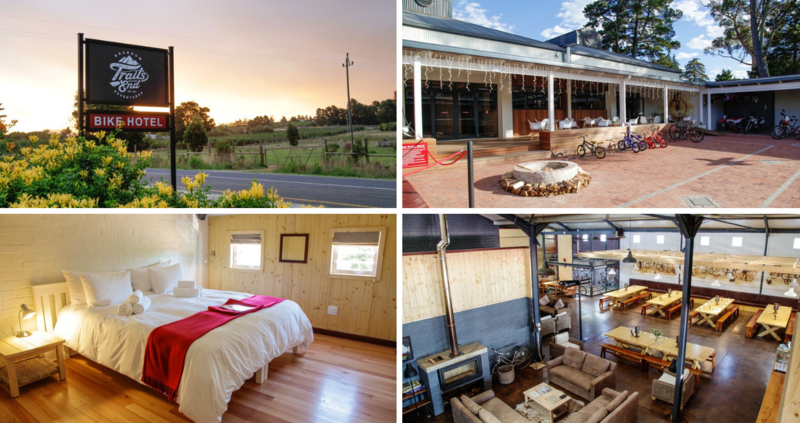 This unique bike hotel is definitely worth a visit — complete with mountain biking and trail running routes, a heated outdoor lap pool, on-site restaurant, bar, pilates classes upon request, a massage therapist, chiropractor and modern conference facilities. If you’re not feeling so adventurous you can relax on the lawn or in the lounge with a drink and a book. There are more than enough activities to keep you busy and the central location allows you to explore the Elgin Valley with ease. After a good night’s rest we enjoyed great coffee that is roasted on the premises and a delicious, healthy breakfast to get us going. The luxurious rooms allowed us to recharge before going on our next adventure not far from there. 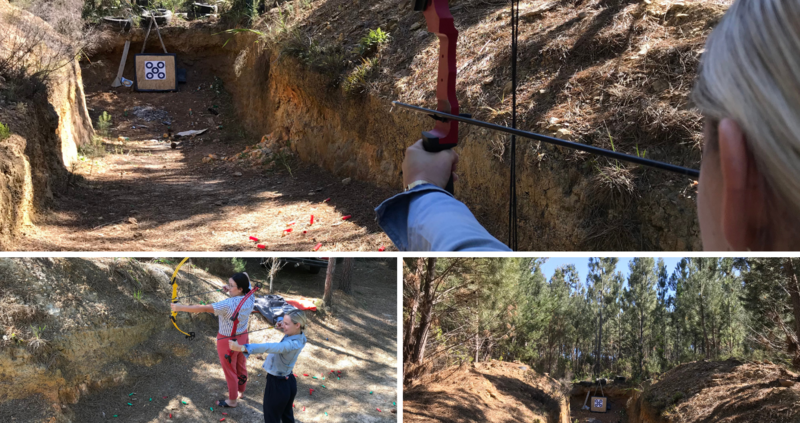 Our first stop was Kunguru Lodge-Tri Active where we were treated with a delicious breakfast and some exciting bow-and-arrow activity. Willem was our instructor for the morning and after he assured us that we didn’t need any experience to give it a go, we got excited to try it. He explained how everything works when we got to the shooting range in the forest and demonstrated with ease. After our first attempts we were hooked and tried to hit bullseye with every shot — it looks easier than it is, but we had a blast! You can book adventure activities like archery for small or big groups and team-building exercises on their obstacle course. The lodge is equipped for big groups and offers comfortable lodging in timber cabins and permanent safari tents. 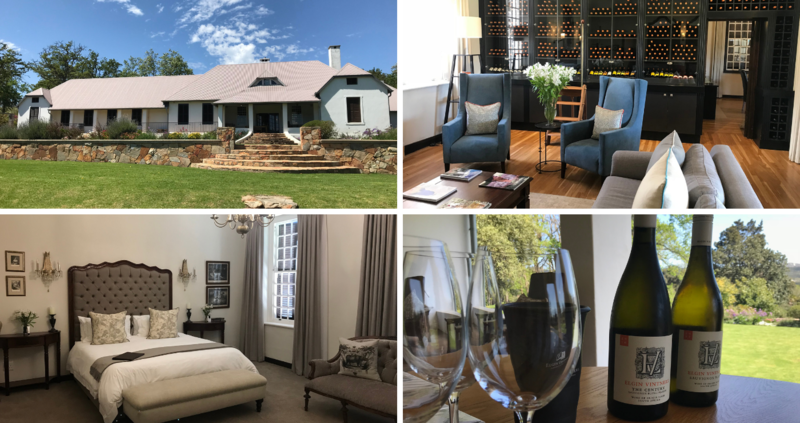 Elgin Vintners was our next stop and this remarkable homestead was the perfect place to unwind after our active morning. Juanrie offered us a delicious wine tasting on the veranda overlooking the gorgeous garden and Hottentots Holland Mountains. This 800-hectare estate is home to vineyards belonging to six dedicated grape growers who share a passion for the unique Elgin terroir. They have combined their resources to produce award-winning wines that embody the characteristics of the environment. The Century, their Bordeaux blend, particularly stood out and if we didn’t have a lunch reservation to get to, we would’ve stayed there for the rest of the day. If you’re not ready to leave this piece of paradise, you can stay over in the historic Manor House. It offers luxurious accommodation in 5 bedrooms decorated with Victorian-style furnishings. The entire house with self-catering facilities can be booked by a large family or group and it’s the ideal place for a family gathering or a celebration. You have access to the swimming pool and farm where you can enjoy some hiking, mountain biking and walking during your stay. The picturesque setting allows you to completely wind down and recharge. 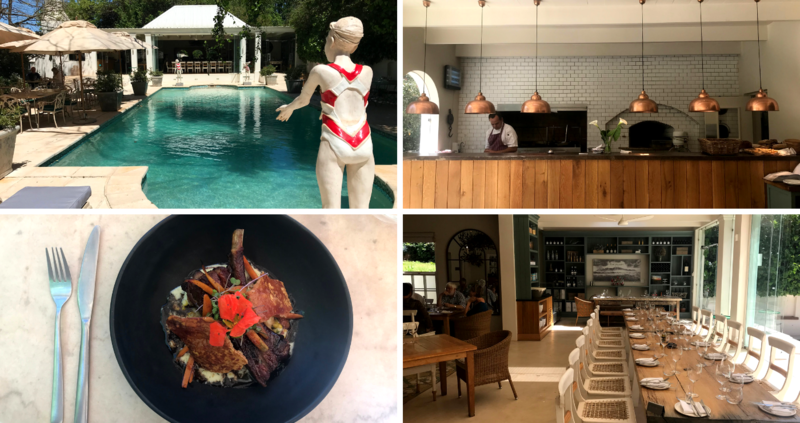 We ended our journey in the Elgin Valley with an unforgettable gastronomic experience at The Pool Room at Oak Valley Wine Estate, and boy was it delicious! We were stunned by the tranquil atmosphere of the restaurant in the lush garden with tables around the turquoise swimming pool — you can sit there all day! Chef Gordon Manual uses locally-grown produce to create an authentic farm-to-fork experience that will leave you speechless. It was difficult to choose from the spectacular menu and we eventually decided on Braised Pork Belly and Oak Valley Free Range Beef for our mains. We savoured every bite before we moved on to the very special dessert — White Chocolate Crème Brulee and Licorice Ice Cream! Being on a wine farm, it is only suited that you pair your meal with some of Oak Valley’s delicious wine. The restaurant offers a tasting area at the back where you can taste some of their wines and purchase it too. Be sure to visit The Pool Room on your visit to Elgin. You won’t be sorry! It was difficult to leave this magnificent valley and its friendly people to return to the city on Sunday, but we are definitely coming back. There are still so many gems waiting to be discovered and Elgin is the ideal place for a quick drive from the city or a weekend escape. Don’t miss out on everything that it has to offer ─ book your next getaway today! A special thanks to everyone in Elgin who made our visit unforgettable. We will see you again soon! All photos by Daniëlle Terblanche and Nanje Lourens, unless stated otherwise.